Solar wind generated by the sun is probably driven by a process involving powerful magnetic fields, according to a new study led by UCL researchers based on the latest observations from the Hinode satellite. Scientists have long speculated on the source of solar winds. The Extreme Ultraviolet Imaging Spectrometer (EIS), on board the Japanese-UK-US Hinode satellite, is now generating unprecedented observations enabling scientists to provide a new perspective on the 50-year old question of how solar wind is driven. The collaborative study, published in this month's issue of Astrophysical Journal, suggests that a process called slipping reconnection may drive these winds. Deb Baker, lead author from UCL Mullard Space Science Laboratory, says: "Solar wind is an outflow of million-degree gas and magnetic field that engulfs the Earth and other planets. It fills the entire solar system and links with the magnetic fields of the Earth and other planets. Changes in the Sun's million-mile-per-hour wind can induce disturbances within near-Earth space and our upper atmosphere and yet we still don't know what drives these outflows." "However, our latest study suggests that it is the release of energy stored in solar magnetic fields which provides the additional driver for the solar wind. 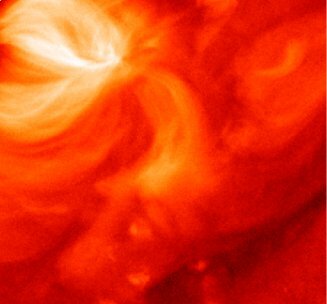 This magnetic energy release is most efficient in the brightest regions of activity on the Sun's surface, called active regions or sunspot groups, which are strong concentrations of magnetic field. We believe that this fundamental process happens everywhere on the Sun on virtually all scales." Images taken in February 2007 from the EIS instrument showed that hot plasma outflows are due to a process called slipping reconnection. At the edges of active regions where this process can occur, a slow, continuous restructuring of the magnetic field leads to the release of energy and acceleration of particles in the Sun's hot outer atmosphere, known as the corona. Slipping reconnection is the first theory to explain how observed outflows from the Sun can be located over areas of a single magnetic sign, something previously considered improbable. Computer models of the Sun's magnetic field were used to identify regions where slipping reconnection could occur. The locations proposed by the computer model were compared with measurements of the speed of the gas coming from the solar corona. The comparison showed the gas was moving outward at up to 100,000 mph, 1,000 times the wind speed in a hurricane, over the possible slipping reconnection regions. The study was carried out by the UCL Mullard Space Science Laboratory, Observatoire de Paris, Konkoly Observatory in Hungary and Instituto de Astronomía y Física del Espacio in Argentina. Deborah Baker is funded by a Science and Technology Funding Council (STFC) studentship. Hinode is a Japanese mission developed and launched by the Institute of Space and Astronautical Science (ISIS) and Japanese Aerospace Exploration Agency (JAXA), with the National Astronomical Observatory of Japan (NAOJ) as domestic partner and NASA and STFC (UK) as international partners. It is operated by these agencies in co-operation with the European Space Agency (ESA) and Norwegian Space Centre (NSC). Data that served as the basis for the magnetic modelling was provided by the Solar and Heliospheric Observatory (SOHO) Michelson Doppler Imager (MDI) consortium. SOHO is a project of international cooperation between ESA and NASA.